Two Story House, 3 Bedrooms & 2 Baths, Sleeps 9, 1 block from beach & boards! Terrific location in Ocean City's central/boardwalk area. Convenient to all that Ocean City has to offer. Within walking distance to all the activities, yet far enough removed to relax at home and enjoy the quiet of a peaceful summer evening. 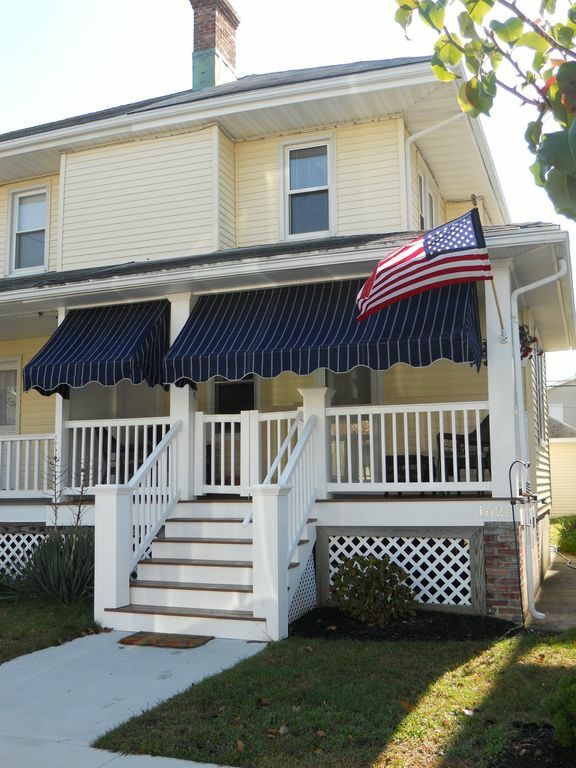 Our classic Ocean City beach house is located just over 1 block to the boards and beach. This tastefully decorated single family three bedroom home has a nice size living room with a 40' HDTV/DVD and brick fireplace. Each bedroom has a wall mounted flat screen TV. The fully equipped kitchen has an electric range, microwave, refrigerator with ice maker, dishwasher and all other items required to accommodate your stay. Pillows, blankets, sheets and comforters are provided. Renters need only bring bath and beach towels. After a day at the beach, you can use our private outdoor shower and enjoy the rest of the afternoon relaxing on the front porch or the rear deck off the Jr. Master Bedroom (both are fully furnished). We have games for our guests to use. An IPhone 5 compatible docking station with radio. A Weber Charcoal Grill with gas ignition. High chair and pack n play for infants. We also provide bicycles, beach cart, beach chairs, children's beach toys, beach mats, beach umbrella, six (6) beach tags and a cooler for your day at the beach. Deposits: A $250.00 deposit is required in order to reserve each week. This deposit then becomes your security deposit. After the deposit is received, a lease will be mailed to you. One half payment is due in one month, with the balance due 30 days prior to occupancy. Discounts are available for multiple weeks. This is a non-smoking home and we do not allow pets. Check-out at 10:30 a.m.; Check in at 2:00 p.m. Renter must be at least 25 years old. No Senior Week Rentals - Families only please. toilet, combination tub/shower, Main bath on second floor. toilet, shower, Second bath located on first floor. Gas fired forced hot air. Linens must be washed, folded and made available for next renter prior to departure. Wood burning, but not to be used by renters. Too much of a liability risk. Dishwasher detergent provided by owner. Coffee Maker is a Keurig. K-cups not provided. Toilet paper in baths, paper towels in kitchen and a box of tissues is provided to welcome our guests. Kitchen trash bags provided by owner. Flat screens in living room, as well as all bedrooms. Balcony is located on second floor off of rear bedroom. Youth to adult bikes. No helmets provided. Fully furnished covered front porch with outdoor ceiling fan and awnings all around. Public tennis courts, both grass and hard surface, are availalbe to rent. Tennis equipment is not provided. Numerous quality golf courses in the immediate area. No equipment provided. Our recent stay was perfect for our family! We especially enjoyed the fact that we did NOT have to bring our own bikes! That is a plus! Great place well equipped and very clean!!!! So glad to have provided you and your family accommodations that allowed you to enjoy your stay. Cleanliness is of the utmost importance to us. It's our home and we appreciate families who treat it like it is their own. Our family loved our stay here. The house was well-maintained and the location to the beach was perfect. John and Amy were very responsive as well. I would highly recommend this house. It's our pleasure to provide families with all that is required in order to create lasting memories. This is our 7th year staying here and there is a huge reason why we keep coming back. This is not just a "shore house." This house holds our memories of our children growing, our friends and families visiting, good meals, great talks, and quiet times on the front porch. There is nothing that we patiently wait for more than our time in this house at the shore. No comment required, other than to say thanks and it has been our pleasure. We always look forward to reviewing the Gershman comments in our shore house guest book. Great house, lots of room, close to shore and grill some great food after a day at the beach! This is our second year and enjoyed the stay along with morning coffee on the porches! Great house to bring the family, we love to cook and enjoy using the grill and kitchen for great dinners. We do our best to provide guests with all amenities in order to ensure a great stay in OCNJ. Return guests are evidence of our accomplishments. John and Amy are wonderful landlords that will make every effort to ensure you have a fantastic vacation. The house is very well kept and clean with plenty of room for storage or taking a break from the weather (rain or sun). Off street parking was no issue. The house comes with plenty of supplies as indicated which saves probably an entire carload. The house is also very quiet with solid walls, as I found out when my kids woke up and I barely heard a peep! I would recommend this house to anyone looking for a beach vacation in a great location in OCNJ. Thanks John and Amy for making our 2017 vacation a success! Such a positive review means a lot to us, as we do our best to provide the accommodations and amenities for families to experience lasting memories in OCNJ. Thanks Courtney for the kind words and so happy to hear you had a wonderful week.